Kildare County Council propose to construct a greenway along the Grand Canal towpath which bisects my town of Sallins. 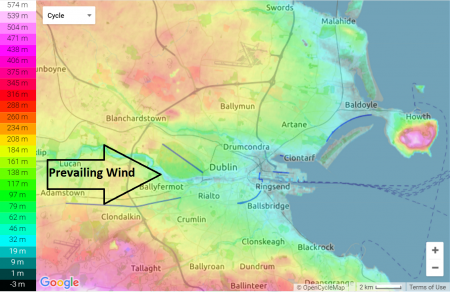 This will link with the already constructed Greenway along the Canal in County Dublin. Eventually there will be a greenway along the full length of the Grand Canal between Dublin and the River Shannon. When complete it will have a continuous length of 132 kilometers (82 miles). 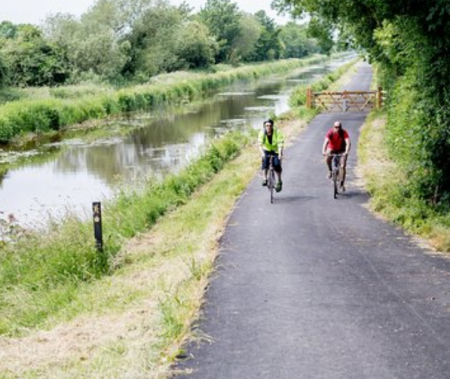 This greenway is close to my heart as besides living beside the Grand Canal, I cycled the full length of the Grand Canal in the summer of 2018, on a mountain bike. At present it is a difficult to cycle along much of the tow path with currently only a small minority being a smooth surface. It is however a beautiful experience and the proposed greenway will make it accessible to many more people. There is a lovely account of walking the full length of the Grand Canal by an American tourist click here. The radio pundit George Hook takes a lot of abuse, from the cycling community, for his strongly expressed view that their behaviour is in main dreadful. While he may go too far sometimes, he has a point when he says that many cyclists show a complete disregard for the rules of the road. The one behaviour that I encounter daily is cyclists using footpaths at speed and more often than not with one hand held to their ear with a phone. Personally, I think its fine for a careful cyclist to use a footpath to avoid using a narrow or dangerous road. But more and more I see cyclists aggressively cycling on footpaths at speed, weaving in and out and around people, and giving them little regard. With our damp and warm climate, algae growth on external surfaces can be a problem. I generally just use a power washer every few years to clean the sheltered concrete areas where it can be a problem. However I discovered that the power washer was unable to remove the algae for my brick garden walls, probably as the brick was more porous than the concrete. However lightly scrubbing the walls using a dilute solution of water and bleach provides an excellent result with little effort, see below. Mixing ash with your garden soil? What to do with your wood stove ash? Well I usually rake it into my garden as it seems a waste to throw in the black or brown bin. But this was only after a bit of trial and error. At first I didn’t mix it in and it then formed a grey lump which looked a bit like soft concrete. It turns out that this is caused by the calcium in the ash which usually makes up 25% of wood ash.